Come hoof it through downtown Nashville on our 45-Minute Private Horse-drawn carriage ride as you explore the sights and sounds of the Music City. 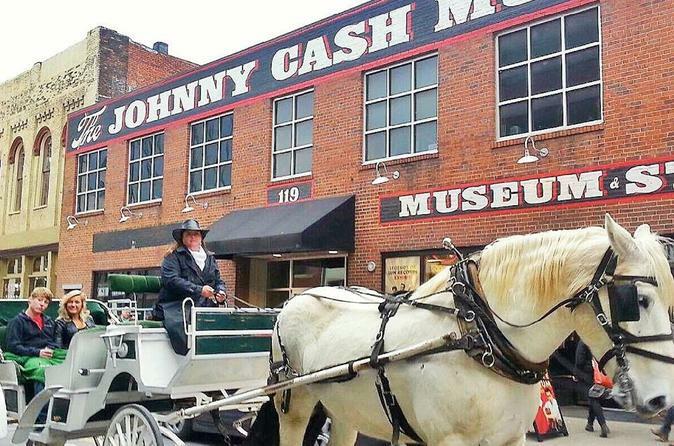 Nashville is an exciting city, so why not ride in a limousine-style white carriage and enjoy all Nashville has to offer. During the months of July & August only rides start at 6pm - 10pm. Our popular 45-Minute Private Narrated Tour of Downtown Nashville has all the sites you will want to see in the Music City plus much more. This carriage tour will take you past some Nashville's well known hot spots such as the 5 Star Historical Presidential Hotel, The Hermitage, Schermerhorn Symphony Center, The Country Music Hall of Fame, The Johnny Cash Museum, Riverfront Park, The Wild Horse Saloon as well as the famous Printers Alley where Jimi Hendrix got his start and became one of the greatest guitarist of all time. As we travel along our great city streets we will also pass by The Tennessee State Capitol Building, The War Memorial Building, The Ryman Auditorium and the Tootsies Orchid Lounge which is a Nashville country music institution and world-famous honky-tonk. Enjoy a horse and carriage ride to remember!